The following is an excerpt from Chapter 3 of Jamie Carter’s unofficial biography of Jason Zodiac. In 1972, I was seventeen, just discovering girls, booze, and music. Good music, which in those days I considered to be Led Zep, Black Sabbath and Lynard Skynrd. Swanning about Brentwood with my Afghan cut-off and arguing with Mum and Dad every time Love Thy Neighbour was on the telly. I bought the T Rex singles but I never called myself a Glam Rocker because it just seemed too poofy. Not for me the likes of The Sweet, or Chicory Tip, or Slade, thank you, because they were all over the radio like chickenpox. 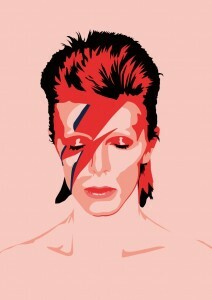 But then there was Bowie. And Jason Zodiac. And Jerome Jerome Smith. Jason Zodiac had left the BBC when The T-Service series came to an end, but in 1971, he drew up a deal with ITV – and he turned up on the kid’s TV show Magpie, saying he was planning a comeback. He starred in Children of the Revolution, the 1971 solo Jason Zodiac Christmas special, and in 1972 he went on tour with his new band – the Pale Angels – to promote their first and only studio album, Space Voodoo. Unlike his old band The Banana Sundial, he wasn’t the vocalist/guitarist, this time. He was the manager. The face of the band and the star of The Pale Angels was…Jerome Jerome Smith. How can I describe J. J. Smith? A sequined footnote in history, a treasure lost down the back of the big fake-leather sofa of pop culture? Even for the standards of the time, he looked weird. In press appearances, he always had the same pale face glittering with painted stars. He had no eyebrows, just finely sketched black lines filled in with red eye shadow. He tottered around with long, skinny legs on platform boots under huge bell-bottoms, a feather boa wrapped around his alabaster neck. Strangest of all, he had deformed hands; he seemed to be missing a few joints in his long, thin fingers, which made people at the time wonder if he’d ever picked up a guitar in his life before. The copy-fax machine hummed and I stood up to collect the pages. Scanned copies of Melody Maker for 22nd January 1972. This entry was posted in Art & Design, Literature, Music, Psychedelia, Short Stories, The Occult, TV, UK. Bookmark the permalink.